Published: September 12, 2017 | This entry was posted in North American New Right and tagged articles, Confederate Monuments, heroes, historical preservation, North American New Right, originals, PhilosophiCat, political correctness. Both comments and trackbacks are currently closed. Specifically, this was an attack on the White race, pure and simple. It is the harbinger of what non-Whites (no doubt aided by their White dupes) plan to do one day, most likely within a decade or two: physically destroy the White race. Whites are witnessing a glimpse into non-White mentality. It happens to one on a personal day-to-day as well. Someone doesn’t like you, wants to harm you, doesn’t dare do what they really would like to do (physically harm you), so they use proxies to show you what they wish to do to you. It is venting steam for them, a harbinger for you of what to expect further down the road. Tearing down a statue isn’t about being honest about history; it’s about tearing down a people’s shared heritage in order to demoralize them. 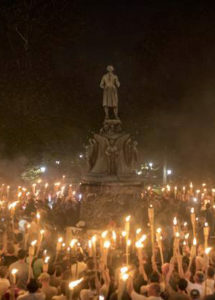 I also think we’re at the point where many of the people tearing down statues, or demanding that statues be torn down, would openly acknowledge that their intention is to demoralize their enemy, namely the white majority, especially those who don’t believe that their national history is a steady sequence of crimes. The statue (“the Confederate Soldiers Monument”) torn down in Durham wasn’t really an example of traditional hero worship. It was basically a monument to soldiers whose names don’t appear in history books, but who often acted heroically nevertheless. Most soldiers in war are normal men who are called upon to risk their lives. They have a right to expect that their sacrifices will be commemorated by their posterity, and that’s what the statue in Durham attempted to do “in memory of the boys who wore gray.” That it could be ripped down to such universal media acclaim indicates how brazen the System has become. Interesting and perhaps correct, but I believe the matter is much more banal than that. The left is running out of meaningful issues with which to bribe minorities and is now flailing around with “symbols of oppression.” Had they understood the monuments as strategical targets, they would have gone after them sooner, right? Too many white’s attitudes are to blame for the mess they are in. I’ve experienced how so many anglos think, the attitude they have. They always pretend, or more stupidly, actually believe these things don’t affect them, as if they can stand aside and will be thought of as the “good whites”, when they fight for or support their own heritage. I’ve noticed this on more and more blogs. All other ethnic groups can celebrate their heritage, customs, preferences and if they somehow conflict with the laws white’s have set up in this country, or any white established country to govern themselves with, right away comes the talk of racism, exclusion, nativism, etc.etc. and usually by other Anglos. My position is, when you are too cowardly to make clear that when in Rome do as the Romans do, you deserve the consequences of your cowardice.